She never made a picture that qualified as a silent screen "classic." Of course the point could be debatable since so little of her work is available for review. So, sadly enough, she is remembered today for being married to Jack Pickford and dying under very mysterious circumstances at a very young 25 years of age. Not surprisingly, her notoriety with Ziegfield led to a movie contract with International Film Company in 1916. It was in March of that same year when she met Jack Pickford at a dance at Nat Goodwin's on the Santa Monica pier. In her autobiography (Off With Their Heads, The MacMillan Company, 1972), famous screenwriter Frances Marion remarked, " . . . I had seen her (Thomas) often at the Pickford home, for she was engaged to Mary's brother, Jack. Two innocent-looking children, they were the gayest, wildest brats who ever stirred the stardust on Broadway. Both were talented, but they were much more interested in playing the roulette of life than in concentrating on their careers." A year after they met, Thomas commented in an interview, "Jack is a beautiful dancer. He danced his way into my heart. We knew each other for eight months before our marriage, and most of that time we gave to dancing. We got along so well on the dance floor that we just naturally decided that we would be able to get along together for the rest of our lives." They were married in October, 1916. Thomas would continue to make pictures signing with Triangle Film Corporation in 1917. She and Jack would often be parted by their careers, and although the marriage was "rocky" at times, they appeared to spend as much time together as possible. In May, 1918, Pickford joined the Navy. According to Charles Foster in Stardust and Shadows (Dundurn Press, 2000), Pickford enlisted to impress Thomas because he feared the marriage was "on the rocks." It wasn't long before Pickford found himself at the center of a scandal. In Mary Pickford, America's Sweetheart (Donald I. Fine, Inc., 1990), author Scott Eyman said Pickford served as a "go-between" for a Lt. Benjamin Davis who arranged safe assignments for "bluebloods" who wanted to be "far away from shot and shell." Eyman goes on to say that Davis was court-martialed and found guilty. Pickford, because he testified for the prosecution, was dishonorably discharged, although it is presumed that Mary and/or her mother, Charlotte, arranged to have the word "dishonorable" removed from his discharge. After over a year together in California making pictures, with the usual occasional separations brought about by going on location (for example, Thomas was in Louisiana January - March, 1920, making a movie), Pickford and Thomas sailed from New York for Paris on Aug. 12, 1920. Upon arrival they checked into the Hotel Ritz for what was planned as a "second honeymoon" designed to save a failing marriage. On the evening of Sept. 9 they went out on the town returning to their rooms about 3 a.m. Within a couple of hours, Pickford reportedly called downstairs that his wife had taken an overdose of medicine and needed a doctor. A doctor arrived in ten minutes to find Thomas "writhing in pain." In his book, Foster provides a theory that many have ascribed to -- that Thomas took a large quantity of mercury bichloride which was prescribed to Pickford for his venereal disease and which he had also passed on to Thomas. He goes on to say that Pickford's doctor had admitted to prescribing the medicine for Pickford in 1917 as a treatment for syphillis. Eyman quotes Pickford as saying he was in bed when he heard Thomas shriek from the bathroom, "Oh, my God!" He rushed to the bathroom and caught her in his arms. She had swallowed a lethal dose of mercury bichloride. In her book Pickford, the Woman Who Made Hollywood (The University Press of Kentucky, 1997), author Eileen Whitfield said the couple had gone to bed after an evening of visiting "the bistros of Montmartre." A half hour later, Thomas was unable to go to sleep and reached for sleeping pills in the dark mistakenly grasping a bottle of bichloride of mercury. "Jack woke to Olive's screams as the pills burned through her throat and stomach. Or perhaps it was a maid who came to Olive's rescue - another story has it that Jack had slipped out for a last-minute round of drugs," she said. Another version of the story, albeit not as popular, is that Thomas, who was known to be impetuous, took the pills to commit suicide, possibly after a row with Pickford. Whatever the true story may be of what happened that night, Thomas suffered for another four days before she passed away. Foster reports director Marshall Neilan as saying he believed Thomas' death was suicide because of the disease. In Mary Pickford and Douglas Fairbanks (W.W. Norton and Company, Inc., 1977), author Booten Herndon said, "Ugly rumors were whispered on both sides of the Atlantic; one was that she had committed suicide because Jack had given her syphillis, another that he had poisoned her for her various infidelities." Whitfield said rumors of Thomas' heroin addiction and venereal disease, as well as her husband's infidelities, were in all the newspapers. One rumor was that Pickford had murdered Thomas for her money, but, as Whitfield observed in her book, that theory "didn't hold water with those who knew him. After all, when Jack was broke, he had only to call his mother or older sister." Eyman noted that "Jack - and undoubtedly Mary - tried to recoup the public relations disaster by renouncing any share of Thomas' small $36,875 estate, but it was too late." No matter, the whole affair was an ugly one with a dark pall surrounding the death of a talented and beautiful young woman who should be remembered for better things. Of course, the investigation into the death resulted in a finding of "accidental death," but, obviously, time has not left her death with such an easy conclusion. Pickford brought his wife's body home, and, on Sept. 24, a funeral was held at St. Thomas Episcopal Church in New York. Over 4,000 people were in attendance. Her body was interred in a crypt at Woodlawn Cemetery in the Bronx. Pickford, with his sister's help, was back into making movies shortly after Thomas' death. In 1922, he made one movie which was financed by Mary Pickford. Also that year, he married another former Ziegfield girl, Marilyn Miller, a marriage that ended in 1927. In 1930, he once again married a former Ziegfield girl which ended in divorce in 1932. In and out of hospitals for several years (the claims were usually a nervous breakdown or exhaustion) Pickford finally died on Jan. 3, 1933. 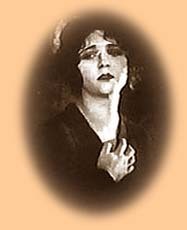 Until 2005, the one and only Olive Thomas feature that was available on video was "Love's Prisoner" (1919), and it is missing the final reel.. Silent film lovers are indebted to Milestone Films for releasing a DVD of "The Flapper" (1920) along with a documentary on Thomas entitled "Everybody's Sweetheart" in 2005. Several more of her films are tucked away in archives and will hopefully be available for home viewing one day. What a loss it is that no more of her work is available on video, and what a greater loss that she died so young at the dawn of the next and greater stage of the silent movie era. Without a doubt, her beauty and charm would have been well-suited for the post World War I audiences, however, what her career could have been is now left only to conjecture. All contents copyright 2001 by Tim Lussier, all rights reserved.